Speed and mobility. Two important words to any notebook owner. Kick it up a notch with our 802.11g, high-speed wireless adapter—Aria™ extreme. This card makes super-fast, mobile networking possible on most CardBus-equipped notebooks, even older models. 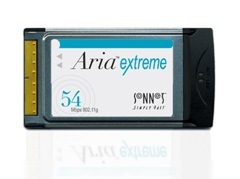 Just install Aria extreme into your Mac PowerBook and you'll be wireless in minutes. Enjoy data transfers of up to 54 Mbps—surf the net without wires or cables! Compatible with Apple Airport Extreme and other 802.11g wireless hubs.